Principle of Roller gear / Table Module / ROLLER TURN : Products - TAKAHIRO ENGINEERING WORKS LTD.
Roller gear is a driving system composed of a cam, a turret, and rollers. One rotation of the cam drives one pitch motion of two rollers. 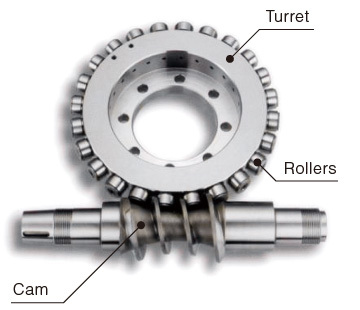 Plural rollers engagement realizes accurate, rigid, and non backlash transmission of the power. The engagement through rollers enables us to put preload between a cam and a turret. This contact with a preload removes backlash between input and output, and attains precise, fast, efficient motion transmission. Non backlash engagement realizes accurate positioning, and keeps its precision in the shuttle motion. We have developed an original modified cam profile exactly to adjust the engagement status which changes according to the numbers of engaged rollers. Roller contact enables us to start and stop swiftly. Roller turn attains to minimize a nonproductive positioning time. Rollers are originally designed under the idea of a tight fit. The diameter of a roller shaft is larger than a commercial cam followers', so the rigidity of Rollerturn is higher than a worm gear NC table. We put the preload considering initial abrasion to keep non backlash status for a long period. The preload effect will be kept almost eternally and set you free from back lash adjustment necessary for a worm table. This smart table improves your factory productivity and the energy efficiency. You enjoy total cost down effect and make larger profit.